Inaugurated on June 19 in the presence of the President of the Republic, Mr. Emmanuel Macron, the 52nd edition of the International Air Show of Le Bourget was described by the organizers as "very good". Indeed, on the placed orders, a 13% increase was recorded. The turnover achieved during the Salon by the professional representatives of the airspace industry reached 150 billion dollars, against 130 billion dollars during the previous edition of 2015. Boeing and Airbus "took the lion's share" with a figure of $ 114 billion in orders, $ 74.8 billion for the American manufacturer and $ 39.7 billion for the European consortium, while CFM International, Aircraft engines of General Electric and Safran, registered some 1,658 orders for LEAP 1A and CFM56 engines, worth $ 27.3 billion. The 2017 edition was a commercial aircraft order announcement festival, and it was a first in the history of the Air Show, with the 1,000 commercial aircraft sold on the first four days of the show. There were no less than 962 sales that were unveiled during the first three days and to this were added 230 others on the morning of June 22nd. In value, the symbolic heading of the 100 Billion Dollars was also crossed, breaking the records of previous salons. During the show, Boeing added a 16th customer for its 737 MAX 10: the rental company AerCap, which converted 15 of its orders for the other models of the family 737 MAX. Total sales and sales to come (letters of intent, letters of commitment, memorandum of understanding) for the 737 MAX 10 now exceed 360 units. Similarly, Tassili Airlines has ordered 3 Boeing 737-800 while an undisclosed customer has committed to 125 Boeing 737 MAX 8 plus purchasing rights on 50 additional aircraft. In summary, Boeing has garnered almost 800 sales during the four professional days of the Paris Air Show. For Airbus, the morning of Thursday June 22 was "Iranian" themed. The European manufacturer has added two more customers to its order books: Zagros Airlines, which has signed a memorandum of understanding for a total of 28 Airbus, split into 20 A320-neo and 8 A330-neo. The second Iranian customer is Iran Airtour who signed for 45 A320-neo aircraft. Future contracts in addition to the 100 medium- and long haul Airbuses already ordered by Iran Air. For Airbus, the sales report announced concerned 326 aircraft of which 144 confirmed sales. A good score, but well below Boeing's, that has garnered nearly 800 sales during the first four days of the Paris Air Show. This clearly shows a rise in the growth of global air transport and the needs of airlines for new generations of planes, which are less fuel-intensive and more in line with the ecology and the planet. However, this commercial success must be highlighted, despite a declining attendance both during professional and public days. Budgetary restrictions in some companies are probably one of the causes, but the real cause is still the state of emergency and the terrorist threats that we are experiencing in Europe, and which make the American or Asian nationals hesitant to travel to Europe. The number of professional visitors registered, being 140,000, caused a 6% decline compared to 2015, despite several thousand people committed to ensuring the safety of the show under very close supervision. For the general public days, there was a decrease of some 10% that was recorded, compared to the 2015 edition. 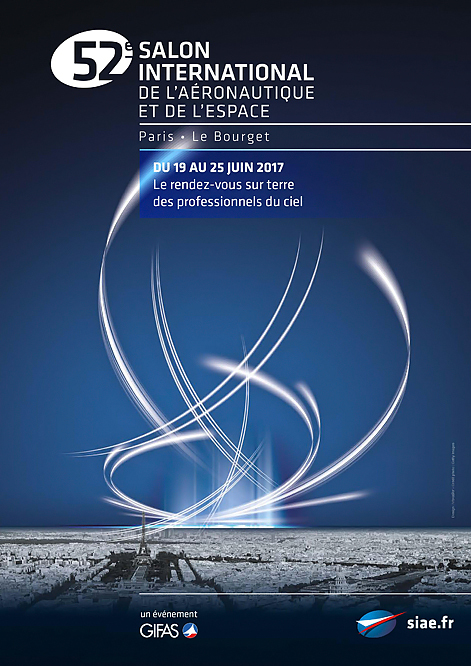 Integrated in the organization of the Paris Motor Show, the third edition of the "Aircraft of Crafts", a forum for employment in the aeronautics sector, registered 60,000 visitors, mainly young people interested in careers in the World of aeronautics. In addition, the launch of the first edition of the Paris Air Lab, an area devoted to research, innovation and prospection, attracted 50,000 people and even allowed some start-ups to register their first orders. Boeing took advantage of the 52nd edition of the Paris Air Show to launch the 737 MAX 10, which comes to compete with the Airbus A321neo. On the first three days of the show, Boeing unveiled the names of the first 15 customers who have ordered or committed to do so for a total of more than 350 copies. Some of these sales come from converting orders of 737 MAX previously spent. This is the case for United Airlines' Boeing 737 MAX 10, originally committed to 737 MAX 9. Other conversions for SpiceJet on 20 units and the TUI group on 18 aircraft of a first order for a total of 70 Boeing 737 MAX in 2013. This is also the case for Gecas, which takes 20 Boeing 737 MAX 10 on purchase, for a total of 170 aircraft from the new medium-haul family powered by CFM Leap-1A. Finally, Copa Airlines' 15 Boeing 737 MAX 10s are taken from an order of 61 aircraft in May 2013. However, the other part are regular sales, which will round off the order book that will cheerfully breach the symbolic cap of 4,000 sales by the end of this year, as the announcements on the 737 MAX 10 should not mask the fact that the Paris Air Show also gave Boeing the opportunity to garner new orders for its 737 MAX 8. This lengthened fuselage variant of the A320neo family will have structural strengthening in the landing gear and wings, increased wing area and other minor modifications due to higher weights. The Airbus A321neo prototype, D-AVXB, first flew on February 9th, 2016. However, the plane suffered a tail strike three days later, requiring the aircraft be flown to Toulouse for repairs. The plane received its type certification with Pratt & Whitney engines on December 15th, 2016 and the EASA and FAA certification for the CFM LEAP 1A powered variant on March 1st, 2017. Leased by GECAS, the first A321neo was delivered in Hamburg to Virgin America, configured with 184 seats and LEAP 1A engines. It entered service in May 2017. All leased from the same lessor, five A321neos should be delivered to Virgin in 2017 and five in 2018 if its buyer Alaska Airlines keeps two fleet types. The neo empty weight is 1.8 tons heavier than the CEO version due to new engines and associated airframe modifications: engine pylons, wing structure and bleed. At the same maximum weight, It reaches flight level 310 30 nautical miles before and 4 min earlier than the CEO model. At 10 000 m (ISA -2 °C and weight 67 tons) it burns 2,200 kilograms per hour at 928 km/h long-range cruise or 2,440 kilograms per hour at 976 km/h high-speed cruise. Airbus has been presenting the A350-1000 since the beginning of the 52nd Paris Air Show. 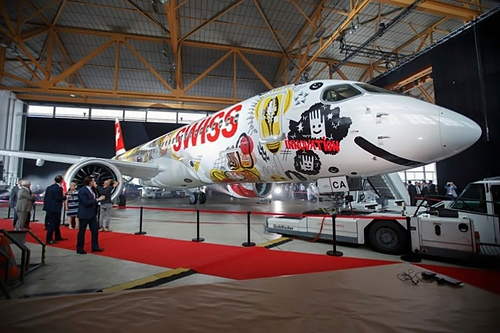 The aircraft that was presented in flight is registered F-WLXV, (msn 65) with the carbon livery. This aircraft is one of the test aircraft that Airbus uses for its tests. The msn 65 is equipped with a cabin that can accommodate 295 passengers in three classes: business, economy premium and economy class. As the aircraft is a testing shipset, it is equipped with numerous sensors and also an area for Airbus engineers. This version is intended to compete with the Boeing 777-300ER and 777-8X. It offers 350 seats in typical configuration, spread over 3 classes, for a range of 15,600 km. The A350-1000 has two objectives within the Airbus range. First, to offer the companies a solution other than the A340-600, whose commercial success has not been on point. Secondly, to compete directly with the B777-300ER, which is now the benchmark in this category. The performance of the A350-1000 is quite similar to that of the B777-300ER, but with an 18% less powerful reactor (431 kN compared to 512 kN), saving fuel. In order to compete with the B777-9X, the A350-1000 will be able to accommodate 390 passengers in 3 classes; In fact, by 2020 the B777-9X (400 seats) will likely arrive on the market and European engineers have been tasked to add 20 additional seats by 2020. Boeing had added 40 additional seats to the B777-9X, Which is too heavy and too large to replace the B777-300ER. In summary, Airbus believes that the market in this category will be buoyant and that the two giants will be able to share it. With the improvement of the A350-1000, the European manufacturer is likely to avoid the path of the A380, technically successful, but facing significant trade difficulties. Airbus also unveiled a new version of the A380 at the Paris Air Show. Named A380plus, it presents some modifications to both aerodynamics and interior fittings in order to increase its profitability in operation. The aircraft manufacturer in Toulouse hopes that with this facelift, it will be able to restart sales of the super jumbo, which have been stalling since January 2016 and thus maintain a minimum cadence for its assembly line in Toulouse. In fact, only 104 A380s remain to be delivered to the airline customers, which has caused the production to drop to one copy per month. At $ 436 million, catalog price, the A380 barely achieves to convince the airlines. So, Airbus's Toulouse engineering office has been working for several months. But no news yet about launching a NEO version with new engines that would reduce fuel consumption by 15%. The technology among engine manufacturers like Rolls Royce is not yet ready for the challenge, it will have to wait until 2025. The idea was to improve the aerodynamics of the aircraft by adding new fins at the end of its wings. 4.7 meters high, to reduce the drag of the aircraft. Airbus promises that fuel economy will reach 4%. The downside is that this new option is only possible on new A380s ordered. The 213 super jumbos already delivered will not be able to benefit, any modification being impossible on the old structures A380. Another modification, this time inside the aircraft. The cabin engineers narrowed the width of the corridors, reduced the stairs to reach the upper deck and added one more seat per row in one part of the aircraft (11 front seats). The capacity of the A380 has increased by 80 seats. By combining all of these options, operating costs at headquarters are declining by around 13% according to Airbus. At the same time, the maximum takeoff weight will be increased to 578 tons, an additional 3 tons to carry the additional 80 passengers. If a company adopts the winglets but does not alter the interior of the cabin, the super jumbo will then be able to fly forty Minutes more, for the same amount of kerosene. For now, Airbus expects twenty A380s delivered in 2017, eight less than in 2016. Boeing, meanwhile, still does not believe the takeoff of the market of very large aircraft within the next twenty years, despite the saturation of the sky. This is the main argument that Airbus puts forward to justify this increasingly costly industrial adventure. Embraer announced nearly $ 2.4 billion in contracts, with orders from Belavia, JAL, KLM City Hopper, Fuji Dream Airlines and two other carriers, whose identities have not yet been disclosed. Embraer recorded a fine harvest of contracts finalized at the Paris Air Show, on the different types of aircraft in its catalog. The Belarusian national carrier, Belavia, announced that it has ordered two additional Embraer (1 E175 and 1 E195) for a catalog price of $ 99.1 million, deliverable in 2018. They will join the four Embraers already operated by Belavia, Two E175s and two E195s. Japan Airlines (JAL), for its part, purchased an E190, for $ 50.6 million, at the list price. KLM City Hopper, the regional subsidiary of the Dutch company, has ordered an additional 2 E190 for $ 101 million, which will be available from 2018. They join the fleet of 30 E190 and 9 E175 already operated by KLM City Hopper. Finally, the Japanese company Fuji Dream Lines committed to a confirmed order of 3 E175, plus 17 others as an option. The total amount of the transaction would be $ 274 million if all options were chosen. Fuji Dream Lines operates an Embraer fleet of 11 aircraft: 3 E170 and 8 E175. At noon, Embraer unveiled two major orders for E190-E2 from two separate customers whose names were not disclosed. The first client made a confirmed commitment on 10 E190-E2, for a total of $ 666 million (with 10 options). The second customer is in final discussions for an order of 20 E190-E2 for an amount of 1.182 billion dollars. Bombardier delivered its fourth CS300 on June 1st, to the airBaltic company, just one week after the first delivery to SWISS. It was the airBaltic aircraft that was presented during the show, highlighting the start-up of deliveries and thus possibly generate new orders. By 2017, airBaltic plans to open at least 13 new lines with the CS300. AirBaltic is currently using it for Amsterdam, Barcelona, Rome, Moscow, London, Paris, Vienna, Athens and Madrid. To date, Bombardier has delivered a total of 13 CSeries aircraft. Dressed in the colors of All Nippon Airways, the Mitsubishi MRJ Japanese jet was one of the great novelties of the 2017 show. It was one of five prototypes participating in the flight test program, launched on November 11 2015. The FTA-5, already dressed in the colors of All Nippon Airways, is dedicated to autopilot testing. Its presence at Le Bourget 2017 is a first for the regional aircraft that participates in its first aeronautical show, presented for the first time at an aeronautics trade show. This presence is also a wink: the MRJ program was officially launched at the 2007 edition of the Paris Air Show. The MRJ program has fallen behind and Mitsubishi engineers have faced a series of technical problems. The latest ones concern the avionics bay and the wiring harness of the aircraft. Five delays have been announced since the start of the program, of which at least four are related to certification issues. As a result, All Nippon Airways, which has ordered 25 copies of this regional jet of more than 70 seats, will still have to wait until mid-2020 as type certification is expected by mid-2019. The Antonov An-132D, which made its first flight on 31 March 2017, was presented at this 2017 edition of the Paris Air Show. This much modernized version of the An-32, produced at a little less than 400 copies between 1983 and 1998, benefits from a strong Westernization. Honeywell, Liebherr Aerospace provided much of its equipment, its engines are Pratt & Whitney Canada PW150A, providing a unit power of 5,071 hp, driving Dowty R408 six blade propellers with a diameter of 4.11 m. The main advantage of the PW150A is that it delivers exactly the same power as the previous Ivchenko AI-20D turbo-prop turbines, whose design dates back to the USSR. The An-132D was designed in record time or almost as the program was launched in May 2015 with a factory outing on December 20, 2016. The twin-engine aircraft is intended for short and medium range: Depending on its payload, which can be extended to 9.2 tons, the unit can travel from 1,400 to 4,400 km. Its hull can also be arranged in different configurations, since it can carry 75 passengers or 46 parachutists with their equipment. The aircraft displays a cruising speed of 500 km / h at the operational ceiling of 9,000 m. It is planned to develop a whole family around the An-132D. The latter is also the first aircraft produced by UOP Aircraft, a cluster developed in 2016 as a result of the strategy of reform of the Ukrainian defense industry. The LM-100J is a derivative of a C-130J-30 Super Hercules, which is currently still the airlifter of choice with 16 nations throughout the world. Through select design changes, the LM-100J will perform as a civilian multi-purpose air freighter capable of rapid and efficient transport of cargo. The LM-100J represents the 17th different mission capability for the C-130J Super Hercules platform and is an updated version of the L-100 cargo aircraft, which Lockheed Martin produced from 1964-1992. The LM-100J made its first flight on May 25, 2017. "The LM-100J has made it easier to make the best of both worlds." George Shultz, Vice President and General Manager, Air Mobility & Maritime Missions at Lockheed Martin. "The LM-100J's presence at the Paris Air Show truly places it on the world's stage, offering an opportunity to highlight its capabilities and unmatched versatility to the global marketplace"
"The LM-100J has performed remarkably well in flight tests just two weeks after its first flight. Because of this strong performance, Lockheed-Martin decided to fly the LM-100J to Paris to be on display at the world's greatest airshow," said George Shultz, vice president and general manager, Air Mobility & Maritime Missions at Lockheed Martin. It was at the Paris Air Show that CFM announced that the Leap-1A dual-flow turbojet engine that powers the Airbus A320neo, and its parent Leap-1B (which in turn drives the Boeing 737MAX), together were awarded the Etops 180 minutes Certificate by the FAA and EASA. The two turbofan engines, before obtaining this qualification, were subjected to a series of tests which are among the hardest for an engine, with an accentuated unbalance, before generating vibrations for a period of three Thousand cycles. That is to say during a series of throttle-up and -downs, simulating three thousand couples takeoff and landings. At the end of these tests, the engines were completely dismantled to be checked by the two air safety agencies. "It's a great success that comes early when the engine is only at the beginning of its use by the various airlines customers," said Allan Paxton, vice president of CFM International. "The CFM56-7B used on the Boeing 737NG has only been awarded this qualification two years after its entry into service, which is why we are all the more proud," he added. 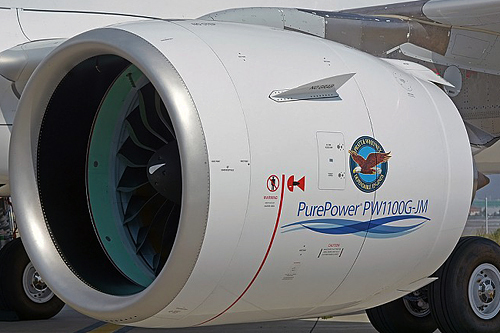 It is on the first day of the Paris Air Show that the American engine manufacturer has announced that it has obtained the 180-minute ETOPS (Extended-Range Twin Engine Operation Performance Standards) certification from its double-flow, reduced-fan turbojet engine, the PW1100G- JM. The latter is one of the two possible choices of motorization of the A320neo, with CFM Leap-1A. The PW1100G-JM had already obtained its FAA 180-min ETOPS certification in December 2016, despite some youth illnesses. ETOPS certification allows commercial aircraft equipped with two engines to use air routes with more than one-hour segments of an emergency airport, including oceanic routes. 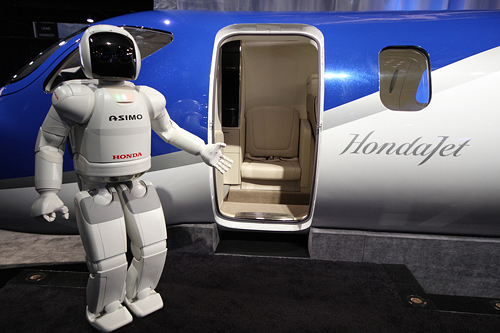 The Hondajet HA-420 was presented for the very first time at the Paris Air Show. It is a business jet that completed its certification process two years ago, too early for the 2015 edition. The HondaJet is first and foremost the first genuine Japanese business aircraft, but also the first civilian aircraft designed in the Archipelago since the 1960s and the Mitsubishi MU-2. Designed to be operated by a single pilot, this aircraft can accommodate five or even six passengers. Its speed is 778 km / h, or 420 KTAS, hence its name HA-420. Technologically, it shows some boldness, notably in its fuselage made of composite materials, honeycomb structures which allow both to reduce the mass but also to simplify the construction of the twin-engine aircraft, and an unusual engine layout, which has not been used since the VFW-Fokker 614, an aircraft that can be described as a "commercial misfire". One of the most interesting advantages of this configuration is to increase the lift coefficient to 7%, which makes it possible to reduce the stalling speeds. Unlike most business jets, the engines are not located at the rear of the fuselage, which would require structural reinforcements and thus limit cabin space. Even with it is Japanese origin, the HondaJet has a strong American accent to it and, apart from General Electric that ensures the engine, the aeronautic manufacturer calls on other equipment manufacturers such as Garmin (G3000 "customized" and highly automated avionics), Hexcel (composites), GKN (fuselage subassemblies) or Avcorp (wing subsets). And many other Western industrialists are also participating in the program. 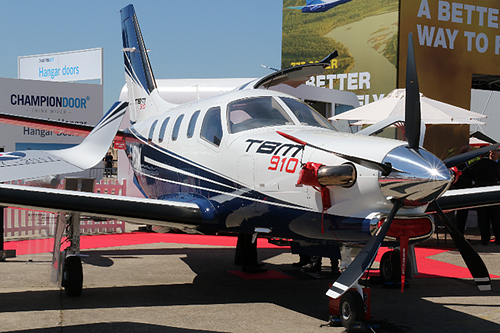 Daher just revealed its newest, the TBM 910 that will follow the TBM 900. The new model incorporates the Garmin G1000NXi avionics with changes in the passenger cabin. The latter has redesigned seats and equipment identical to those of the TBM 930. The G1000NXi avionics are more advanced than the G1000 used on the TBM 900, thanks to the support of recent processors that allow the system to incorporate both more data, and maps. According to the manufacturer, the TBM 910 has the same autonomy, performance and technical characteristics as its predecessor. The first TBM 910 is expected to be delivered in June. The Garmin G1000 NXi combines high-resolution displays with next-generation processors. These enhancements allow for system start-up and fast software loading, while allowing more aeronautical data and maps to be managed (e.g. visual flight cards). Other advantages of the new system include increased driver perception and increased cockpit connectivity. Via a wireless transmission system, the G1000 NXi can communicate with a tablet using the Garmin Pilot application, which allows, among other things, the updating of its databases. Finally, the physical keyboard has a new joystick allowing more precise movements on the screen and a smoother navigation on the various pages of the multifunction display. TAI-Turkish Aerospace Industries Inc., revealed the T625 Multi-Role Helicopter at Paris Air Show 2017. This is a new generation, twin engine, 6-ton class helicopter developed in response to the growing market demand for higher mission flexibility in this class. T625 is designed and optimized to meet and exceed the multi-mission requirements for hot & high geographical environments, and for adverse weather conditions. The aircraft incorporates several new technology features to provide the highest level of safety and operational benefits for operators. Within the scope of the contract signed between TAI-Turkish Aerospace Industries, Inc. and Under-secretariat for Defense Industries (SSM) in 2013, T625 Multi-Role Helicopter is being developed for both domestic and international markets. The cockpit provides a comfortable and high visibility environment for pilots. T625 cabin is designed for comfortable seating for 12 passengers. The extensive cabin space can be configured to meet the requirements of multi-purpose operations such as cargo, VIP transportation, ambulance, offshore and search & rescue operations. The geometry of the helicopter is optimized for maximum aerodynamic performance with retractable landing gears hence providing an efficient fuel consumption leading to better range and endurance. T625 incorporates two LHTEC (Rolls Royce & Honeywell Partnership) CTS800 turbo shaft engines, 1373 shp each, enabling the aircraft to perform in hot & high environments and perform safely in one engine loss condition for Category-A certification. T625 is designed for IFR and VFR single pilot operations, night operations and flight in known icing conditions. It is a very strange vehicle that was presented at the Paris Air Show, away from the big conventional aircraft. Surefly is an octocopter drone designed by Workhorse. While the general trend is for small drones to capture images or race, this one is designed for transport. It can carry two people over a distance of more than 112 kilometers. Under the hood is a Honda engine developing 200 horsepower and lithium batteries. These take over in case of technical failure of the engine. They provide an additional five-minute autonomy for an emergency landing. To ensure maximum safety, the drone also includes a parachute in case of extreme emergency. It will of course require a private pilot's degree to have the right to use it even if it is still unclear what legislation it will report, after the modifications concerning the use of drones. Workhorse is also working on a totally self-contained version that would be more focused on large-scale freight transport. You can now make a $ 1000 refundable deposit to reserve one of the first vehicles from Workhorse. However, the final price should be very high. The specialist sites predict a price of $ 200,000 minimum. It is much more expensive than a classic car obviously, but personally, mine does not fly! This year, for the first time, the Embraer KC-390 landed on the tarmac of the Paris Air Show. Already last year, the Brazilian transport plane had crossed the Atlantic to be presented at the Farnborough fair. Since April 2016, two prototypes of the nearly identical Embraer KC-390 are now available for flight-testing. After the inaugural flight of the first of these aircraft, the two aircraft accumulated more than 1000 flight hours. That is about half of the program planned for all trials. Embraer has already made several important milestones. Parachute dropping trips through the rear ramp, and automatic drops from the side doors were conclusive. Load releases have also taken place and recently the Brazilian aircraft manufacturer has carried out tests of validation of the extraction parachutes, necessary for the release of the heaviest loads. With regard to in-flight refueling, dry contact tests were conducted with F-5 fighter aircraft from the Brazilian Air Force. Embraer is currently preparing for the complete testing of the in-flight refueling system of the aircraft (which is carried out with nacelles placed under the wing and carrying flexible sleeves). Positive wind and takeoff tests were conducted in Patagonia in Chile and Argentina. The aircraft was also tested on a wet track. On the other hand, Embraer has not yet announced a schedule for short track trials (Grass, soil, sand...). Static tests on land also take place for certification of the aircraft. Tests on the wing are now complete. The platform used to test the fatigue of the structure has just been assembled. Thanks to a test bench in the cargo area of the KC-390, Embraer was able to certify the carriage of different types of vehicles in service in the Brazilian army. For example, the machine can carry two M113 tracked vehicles. All of these tests should lead to the proclamation of the KC-390 IOC (Initial Operational Capability) by the end of 2017. The first series aircraft, which is currently being assembled, is expected to be delivered to Brazil in 2018. Brasilia ordered 28 KC-390. Embraer is also pursuing its campaign to promote the KC-390. 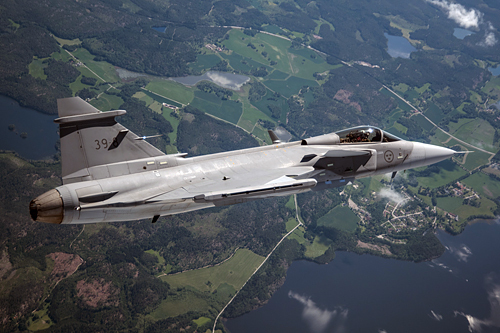 Before Le Bourget, the aircraft passed through Sweden countries that collaborate with Embraer on the Gripen NG program. According to representatives of the Brazilian group several potential customers have expressed interest, Brazil, of course, Argentina, the Czech Republic and Portugal. Leonardo wants to build on the success of its M346 aircraft and make it a light fighter thanks to the integration of new equipment and armaments. The Leonardo M346 can already be described as export success. The training machine was chosen by Poland, Israel, Singapore and the United Arab Emirates in addition to Italy. The Italian manufacturer hopes to conquer new markets with its platform by proposing a new version called M346FA for "Fighter Attack". It is therefore a new concept based on the M346, an aircraft designed at the base as an advanced training aircraft. 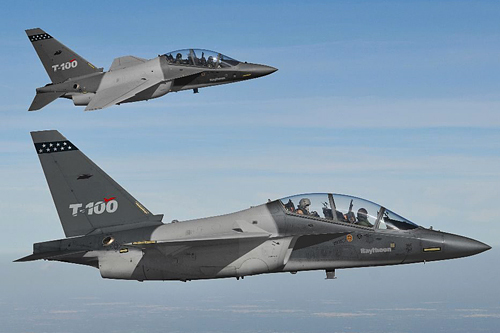 Leonardo speaks of a family concept of aircraft because from the basic version of the M346 different systems can be integrated to gradually transform the training aircraft into a light fighter. The promoters of the concept insist that the characteristics of the training aircraft are retained, thus always allowing the use of M346FA for training. The basic characteristics of the M346 are adapted, according to Leonardo, to its transformation into attack aircraft. Especially the fact that the plane has a two-seater configuration to share the workload of the crew. Integrated systems include a designation pod (flight tests have started), a recognition pod (the Rafael RecceLite pod is already integrated on M346), a tactical data link and a self-protection suite. With this first "kit", systems can be added, such as radar. Leonardo selected the Grifo-346 multi-mode radar. A system with an announced range of 50 nautical miles can simultaneously pursue 10 objectives and equipped with an IFF interrogator. Leonardo also offers the integration of a wide array of weapons including GBU-12, 49 or 38 guided bombs. At the moment separation tests have been carried out with Mk-82 and 83 bombs. The air- Brimstone or anti-Martel ER, MBDA could also be integrated. On the side of the air-to-air weapon, two points of attack can be added at the end of wings for short-range missiles. The range of air-to-air missiles could include the AIM-9X Sidewinder or the IRIS-T. At the center point, the M346FA can carry a gun nacelle. In total, the M346FA could carry 2000 Kg of equipment thanks to seven points of airports. The most original in the range of improvements offered by Leonardo is a kit aimed at reducing the radar signature of the aircraft. This includes a cockpit and liner treatment as well as air outlets to make the M346FA stealthier. Leonardo believes that there is a significant market for light attack or advanced training aircraft. The M346FA should tackle the top of the market. The Italian industrialist highlights the low cost per hour of flight of his plane compared to the so-called front-line fighters. The use of the M346FA for advanced training, training and combat would therefore be an economical solution. Leonardo is also presenting his basic training aircraft M345 during this Paris Air Show. This single-engine was ordered in early 2017 by Italy. The Italian government plans to acquire a total of 45 M345. According to Leonardo the development program of the aircraft is in accordance with the announced calendar. The first aircraft made its maiden flight in December 2016. A first pre-series aircraft is in production. It is expected to make its first flight in 2018. Leonardo is aiming for a series production of 20 aircraft per year by 2021. Italian industrialist has announced that advanced negotiations are currently underway with two potential customers and that a second contract Order could be signed before the end of 2017 without disclosing the identity of the buying country. 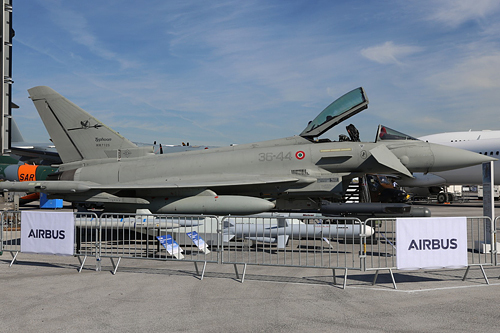 Despite Raytheon's withdrawal, the Italian aircraft manufacturer has decided to continue offering its T-100 program to the TX program, in front of Lockheed Martin / KAI (Korean Aerospace Industries) with its T-50A and Boeing Saab with its jet Mono reactor. Leonardo found a new American partner, working with DRS Technologies, two weeks after announcing the end of its partnership with Raytheon. DRS Technologies, based in Arlington, Virginia, was acquired in 2008 by Leonardo (then Finmeccanica) and the company will have full control of the T-100, for which it is currently looking for a plant Assembly of the T-100. Raytheon was not the only one to withdraw from the competition, as Northrop Grumman did the same by announcing it on February 1st. On June 19, Lockheed Martin and Tata signed an agreement for the production of F-16 Block 70 as part of the "Made in India" project. This agreement represents Tata's "opportunity to produce, operate and export the F-16 Block 70 aircraft," reports Lockheed Martin. It strengthens India's aeronautical capabilities and the relationship between the two countries. This agreement builds on the joint venture between Lockheed Martin and Tata and underscores the relationship and commitment between the two companies. The two countries are already working together on the C-130 program for which India is providing components. In return, Lockheed Martin offers training to strengthen the skills of Tata employees. The two companies also cooperate on the S-92 helicopter. Turkish Aerospace Industries has sent both prototypes of the Hurkus-A aircraft to Le Bourget as it begins an international sales drive competing against Pilatus's PC-21, the Korea Aerospace Industries KT-1 Woong-bi and Beechcraft T-6 Texan II. Test pilot Murat Keles, a former Turkish Air Force F-16 pilot and founder of the Soloturk F-16 demonstration team, is putting the second prototype Hurkus through its paces in the Le Bourget skies, while the first prototype, painted up to act as a demonstrator for a light-attack version of the aircraft, is featured in the static display. The Hurkus-A is the basic version of the Pratt & Whitney Canada PT6A-68T-powered 8,046-lb. (3,650-kg.) gross-weight trainer, which received European Aviation Safety Agency certification in July 2016. TAI is now building the Hurkus-B, an advanced trainer version kitted out with an Aselsan-developed avionics suite, which will be used for Turkish Air Force training. The avionics suite features simulated systems that will allow the air force to download some of its advanced training tasks from the more costly T-38M Talon. Some 15 Hurkus-Bs are on order, but the air force has options for 40 more. The first Hurkus-B is due to fly at the end of the year 2017. Work on the light-attack version is also advanced. In April, the first prototype Hurkus modified with wing pylons and fitted with an under-fuselage electro-optical camera carried out a successful test firing of a Roketsan Laser-UMTAS (L-UMTAS)/Mizrak laser-guided missile in Konya. These tests, witnessed by senior Turkish officials, led to the signing in May at the IDEF defense show in Istanbul of a letter of intent to purchase up to 24 light attack versions, to be called Hurkus-C.
TAI ferried the Hurkuses to Le Bourget via Serbia, Croatia, Germany, and Paris. This 11-meter-long, 20.5-meter Chinese drone looks like two drops of water to the undisputed leader of armed surveillance drones: the American Reaper MQ-9. It would also cost four times less (about $ 1 million). Wing Loong II, capable of flying up to 9,000 meters above sea level at a speed of 370 km / h, can carry 480 kg of weapons on its six points of loading, or 12 Air-Sol ammunition in total, for Identification and strike missions. For reconnaissance missions, it can count on a complete optronic sequence as well as a synthetic aperture radar. This mastodon that can stay 20 hours in flight has already scored points for export since Saudi Arabia ordered 300 copies at the beginning of the year. The Wahhabi kingdom already uses the previous version, the Wing Loong I, since 2014, for missions of recognition and strikes in Yemen. The mid-life update of the Mirage 2000D was launched at a ministerial investment committee (CMI) of the Ministry of Defense and will cost some 160 million euros. But this amount will increase significantly with the green light from the Ministry of Defense. This operation will concern 55 Mirage 2000D on the 71 aircraft currently in service within the Air Force. By the year 2030, another 55 powerful fighting planes will be available, knowing that they are still extremely solicited during external operations (OPEX). The decision announced by the DGA thus provides for the upgrading of 55 aircraft out of the 71 in the park to date, with the first deliveries expected for 2020. The heart of the upcoming renovation of the 2000D will deal with the treatment of obsolescences So as to preserve its bombardment capabilities. Absence of radar, avionics, but certainly also electronic countermeasures. It is paradoxical that the Mirage 2000D engaged today in the Middle East has a self-protection judged by many inferior in quality to that of the last Mirage F1 withdrawn from service in 2014. Another essential project is the homogenization of on-board equipment: the Air Force now has only a very small fleet of so-called "full option" aircraft. This park is reserved primarily for the Opex, with some planes kept in mainland France for the training of the crews. It could therefore have 55 aircraft all benefiting from the Link 16 link, the Epak box to fire the GBU-49, the VHF-FM radio to communicate with the ground troops, the Rover modem and the radio encryption. All those little things that are no luxury on a complicated theater of operations. The integration of a gun nacelle is also cited. A positive point for the aircraft's versatility and its ability to make warning shots and air-ground destruction. The carriage of a nacelle under the front left-hand point has already been opened. The right front side point will remain the prerogative of the laser designation pod, with the anticipated integration of Thales' future Talios pod, which will bring much not only targeting but also intelligence work. We are talking about the purchase of 20 cannon gondolas for the 2000D without knowing for the time whether it will be new equipment or recovery. The withdrawal of service from the Mirage F1C left a beautiful park of DEFA guns available in 30mm. There are still two surprising points. First of all, the replacement of the Magic 2 self-protection missile, which comes to the end of its life, by the MICA-IR. On paper it's a lot of punch given to the 2000D. But in fact, the missile will probably be integrated at minima and usable well below its capabilities, for lack of adequate radar. The other point concerns the possible integration of the AASM self-propelled ammunition. Often mentioned, it would not be a part of the perimeter of the renovation. Damage to Safran Electronics & Defense, designer and manufacturer of the ammunition, but this technical choice seems logical: the Mirage can already take away the GBU-49, which also has a guidance mode mixed, laser and GPS. Certainly the AASM has the scope provided by its propeller and label made in France, but the GBU-49 is much cheaper. When we fire several hundred rounds on pickups, the slate increases rapidly. The Mirage 2000D of tests presented on the statics of the Ministry of Armies at the Paris Air Show has already made it possible to take stock of the various tests and evaluations underway in the Flight Test Division of the DGA and in particular on the Mirage 2000D program. SABCA launches a full range of services for drones. In search of valorization of its skills and experience, the industrialist SABCA announced at the Paris Air Show the launch of a full range of services for drones. This range will be aimed at the entire ecosystem of professional drones (commercial, governmental and defense): manufacturers, application developers, users and regulators. This will accelerate the professionalization and development of a sector of drones in search of credibility. The SABCA service panel includes the integration of new systems for controlled air skies, subsystem ground and flight tests, certification, qualification, support. A complete chain therefore, which calls on certain partners, particularly for the integration, particularly essential, in the airspace. A partnership was signed with the Drone Port in Limbourg to test the drones in a free airspace before testing them in a controlled air environment in the SABCA Group's infrastructures at the Charleroi airport. In addition, the SABCA Group will offer services that are part of more comprehensive support activities, such as inspection, maintenance, repair and support as well as the training of remote pilots and ground personnel. At the end of 2015, the Sonaca group announced the creation of the Sonaca Aircraft subsidiary dedicated to the development, certification and marketing of a new training aircraft called Sonaca 200. The two-seater single-engine Training of pilots and recreational flights, is currently being certified. The Belgian company had a way to mark the beginning of the Paris Air Show by making the first flight of the first plane in its history. On Monday 19 June, the Sonaca 200 took off for the first test flights, starting a 4-month campaign that will start in Belgium and continue in Avignon, in the south of France. A demonstration aircraft is currently being tested in Belgium and neighboring countries. "The feedback from the users is excellent. We identify the latest changes to the aircraft. These are mainly structural; they are designed to improve reliability, robustness and maintenance costs, "said Pierre Van Wetter, Marketing & Sales Director, Sonaca Aircraft. The Sonaca 200 will be EASA certified for a maximum takeoff weight of 750 kg and a cruising speed of 115 knots. In addition to obtaining type certification, Sonaca Aircraft has initiated a DOA and POA certification process. "The production site will be certified to European standards. We will be allowed, to some extent, to modify the aircraft without having to introduce new applications for certification. This will allow us to limit costs, to be autonomous and responsive, "says Pierre Van Wetter. With a capital of more than 2 million euros, Sonaca Aircraft is 65% owned by Sonaca aerospace equipment manufacturer and 25% owned by The Airplane Factory. "Benefiting from the financial support of renowned industrial players guarantees a financial solidity to the project and allows us to make rapid progress with the commercialization of the aircraft," comments Yves Delatte, CEO of Sonaca Aircraft. In the light aviation market, the aircraft is distinguished mainly by its low maintenance cost, its low fuel consumption and the quality of after-sales service. "As a subsidiary of the Sonaca Group (a direct supplier of Airbus, Dassault, Embraer and Bombardier), Sonaca Aircraft provides world-class technical support to its aircraft, including delivery of spare parts and repair solutions within 48 hours in order to minimize the grounding of the aircraft. "Assures Yves Delatte. Assembled in Belgium, the aircraft is already marketed. The first deliveries are scheduled for the end of 2017. A 4-seater version of the aircraft is currently under study. The first aircraft (Test Aircraft 1) at the Sonaca site in Belgium is mainly dedicated to ground testing. "We tested the strength of the seats, belts, engine mount and front strut by simulating hard or crosswind landings. Wing strength tests were entrusted to the IABG, An aeronautical test center based in Germany and specialized in resistance testing, "commented Vincent Jaumotte, test engineer for Sonaca Aircraft. A second aircraft (Test Aircraft 2) will be used for flight-testing. The start-up of the Sonaca 200 production operations began in June 2017. 30 Aircraft have already been sold in Belgium, France, the United Kingdom, the Netherlands and Germany. The first deliveries are expected to start at the end of 2017 and will continue at the rate of about 20 aircraft per year. Saab JAS-39 E Gripen first flight on the eve of the Paris Air Show. Saab announced the first flight of its new fighter Gripen E. The aircraft took off on June 15, 2017 at 10:32 local time from Linköping aerodrome. The Gripen E, piloted by Marcus Wandt, evolved for 40 minutes over the Östergötland. The tests included operation tests of the landing gear. Apparently, the Gripen E differs little from those predecessors including the Gripen C currently in service. But the aircraft has several major innovations. The platform has been adapted. The fuselage was lengthened by about 50 cm to cancel out the effect of the increased mass of the new radar. The structural modifications also allow an increase in fuel and weapons. The new equipment includes the Selex ES-05 Raven Electronic Scanning Radar (AESA). The Gripen E is equipped with a passive infrared detection system IRST mounted in front of the cockpit. The aircraft's electronic warfare system has also been upgraded. A GE Aviation F414G with a maximum speed of Mach 2 provides the propulsion. The aircraft has nine points and can take off with a maximum weight of 16,500 kg (unloaded mass of 8,000 kg and Capacity of 3 400 kg of fuel internally). The Gripen E can also carry three pendulum fuel tanks. Saab announces that a large arming game can be integrated including the air-to-air missiles Iris-T and Meteor. The aircraft is equipped with a Mauser BK27 27 mm gun. Different pods can be embarked including Litening, Reccelite, DJRP or MRPS. 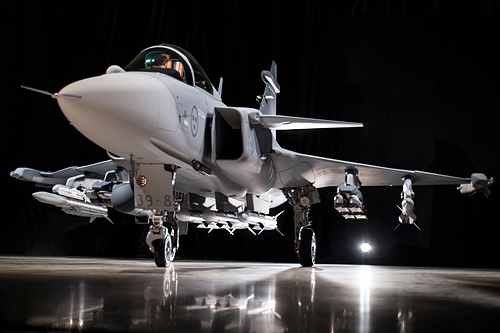 The Gripen E has already been ordered by the Swedish Air Force and by Brazil under the calling name Gripen NG. But since the closure of the Bourget 2017 edition and this maiden flight, we have taken that the Swedish manufacturer has withdrawn his candidacy from the market for the replacement of the Belgian F-16s believe that the specifications already puts the Swedish candidate on the side . The Swedish solution being too light in relation to Belgium's external operations and, moreover, the Swedish Government's refusal to offer a weapon system capable of carrying out nuclear strikes while this option is in the Belgian specifications. Often presented as an outsider against the F-35A and the Rafale C, the Eurofighter tries to score points in the tender for the replacement of Belgian F-16AMs. The consortium would consider, if its offer were chosen, to propose to Belgium to join the consortium in which Germany, the United Kingdom, Spain and Italy are currently joined. There would be no question of producing elements of Eurofighter in Belgium as the Italian and British production chains will close, without new orders, in 2018 and 2022 respectively. On the other hand, Belgium could be associated with the continuous development of the apparatus for example for simulator training of pilots, training of technicians and learning of cybernetic systems. Already, the Eurofighter consortium's industrialists generate a turnover in Belgium of some 600 million from 200 suppliers (375 million euros for Wallonia in 2016, 130 for Flanders and 95 for Brussels). One figure Business, constantly increasing, mainly driven by the Airbus order book. Launched in the 1990s by Germany, the United Kingdom, Spain and Italy, the Eurofighter is built by Airbus in collaboration with the British BAE Systems and the Italian Leonardo. The aircraft was sold to 587 aircraft worldwide by eight countries: the four initial members of the consortium, Austria, Saudi Arabia, the Sultanate of Oman and, since the end of last year Kuwait. Commissioned in 2003, the Typhoon is presented as a multi-role combat aircraft. The British government is proposing it as a successor to the aging F-16s, which have to be replaced between 2023 and 2028. Less than a hundred aircraft remain to be delivered and the German and Spanish assembly lines will close in 2018. The delivery of the Kuwaiti aircraft should conclude in 2022.. The F-35 fighter aircraft flies for the first time at the Paris Air Show with the hope of seducing new European customers (certainly Belgium) and forgetting its technical and financial problems. 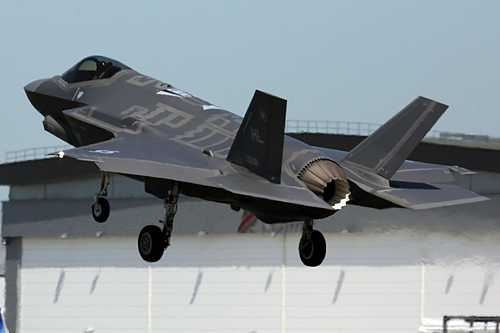 An F-35A stealth aircraft provided a demonstration of approximately eight minutes each day of the week, except on Thursdays, providing an opportunity to prove the capabilities of Lockheed Martin's aircraft, while its near-air combat performance sometimes Been deemed limited (and appears to be confirmed during the demonstration). Finland and Belgium asked Lockheed-Martin to participate in their future competition for a combat aircraft and LM took advantage of this opportunity to provide all the information potential buyers need. Let us also note that the Germans have recently contacted LM showing interest in replacing the Tornado. Launched in the early 1990s, the F-35, developed by the US defense group Lockheed-Martin, is the most expensive weapons program in US military history, with a total estimated cost of nearly $ 400 billion Of dollars for the Pentagon, for a goal of nearly 2,500 planes to be produced in the coming decades. The United States has associated eight partners in the design of the single engine (Australia, Canada, Denmark, Italy, Norway, the Netherlands, the United Kingdom and Turkey) and has been exported to three other countries (South Korea, Israel and Japan). The plane is now trying to improve its reputation while its reputation has been tainted by technical concerns. A hypoxia problem for the pilots has just grounded about fifty F-35A from Luke AFB in Arizona for eleven days. It was mostly criticized for its astronomical cost, which has only kept it in the course of its development. US President Donald Trump did not hesitate to cite him as an example of mismanagement of public funds and threatened to order Boeing F / A 18 Super Hornets instead. The price lot after lot is decreasing and the manufacturer announces a trajectory to go under the $ 85 million by plane and maybe close to 80 million by 2020. This is a drastic drop in price ensures the builder. To lower the unit price, the US and Lockheed Martin are looking for new customers. This explains the presence of the F-35 at Le Bourget - whereas there has not been an American stealth aircraft at the show since the F-117 and B-2 appearances in the 1990s. So far, The United States has never been able or never wanted to sell stealth aircraft abroad. On the other hand, the survival of the F-35 program depends on sales to other countries. Even though the F-35 Lockheed Martin and the Dassault Rafale, a technological jewel from Dassault, have never fought in the air against each other, a real commercial war is taking place between these two planes, between the United States And France. If since 2015 Dassault can boast of having sold its plane outside the Hexagon, Qatar, Egypt and India, i.e. 84 aircraft, the plane of Lockheed Martin displays at least 450 orders more (Australia, Canada, Denmark, Italy, Norway, the Netherlands, the United Kingdom and Turkey), to which must be added South Korea, Israel and Japan, which have already acquired it. And the list is not near to stop knowing the renewal of the fleet of fighter planes of Belgium, Switzerland or even Germany. The US pilots have mixed views on the F-35. The US-made fighter aircraft, which looks like a heavier Rafale, is not easy to handle. No matter, his stealth and especially his connectivity, which allows him to carry out missions in network with all other planes, make him a formidable opponent. On paper, yes, it is a beautiful plane, acknowledges a source at Dassault. But this remains theoretical. He has not yet been tested in combat. The French plane was able to show its multi-role capabilities in Mali, Libya, Iraq and Syria. The Rafale does not have to be ashamed of its performances compared to the F-35, especially since the technological advance of the F-35 is not extraordinary and, above all, it pays too much. , The American stealth aircraft is displayed at € 110 million against € 80 million for the Rafale. Difficult to make a prognosis for Belgium, but the fight at Le Bourget between the Rafale C and the F-35A was clear and clear with, in our opinion, a definite advantage in terms of Rafale's maneuverability capabilities. But the choice of an aircraft of this category is not limited to this simple performance, other imperatives come into play. Let us hope and trust that our decision makers will make the optimum and adequate choice.